Shunned by virtually every human in this new world, Naofumi turns to a demi-human slave in Raphtalia, sold to him by the slave merchant for 30 silvers; a bargain. The little raccoon girl is terrified with good reason: she’s been through a lot in her short life and she has no reason to believe Naofumi won’t be cruel and awful to her. But despite his scary face and bad attitude, Naofumi isn’t awful to Raphtalia. I mean, he wouldn’t be much of a rootable MC if he did. Sure, she’s bound by her contract not to defy him and gets shocked if she does, but he makes sure she has proper clothes and a dagger. She’ll provide the offense he needs to become powerful enough for the next Wave of Catastrophe. 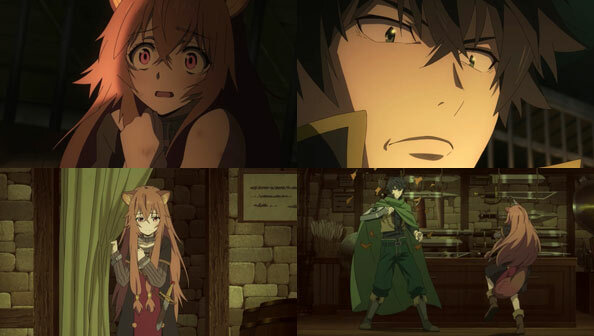 Raphtalia soon learns that she not only need fear Naofumi, but that it’s okay to have things she wants. He’ll take care of her, but she has to fight for him. Of nights Naofumi learns the “mental illness” her buyer warned him about: she has PTSD and nightmares from having witnessed her parents sacrifice themselves to a Cerberus so that she could live during the First Wave. 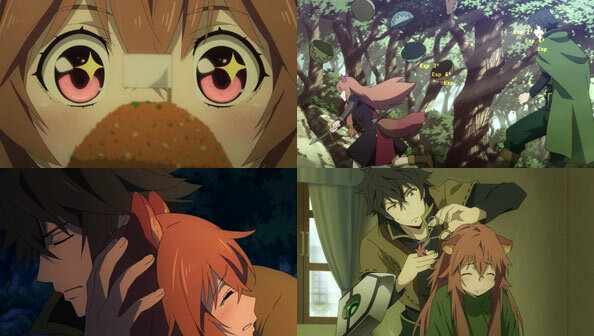 In a montage made all the more satisfying and significant (like the show itself) by the wonderful score by Kevin Pankin (Made in Abyss), Raphtalia learns to trust and even become fond of her master, who treats her more like a ward than a slave. The more monsters she defeats, the more the two of them level up, and the more money they make. 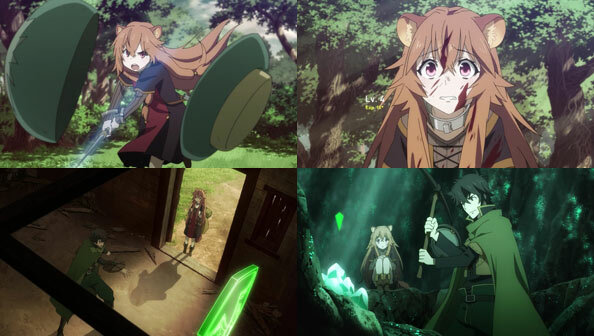 Raphtalia butts up against adversity when a rabbit attacks Naofumi and she has to draw blood, which she’s quite justifiably afraid of considering her traumatic past. 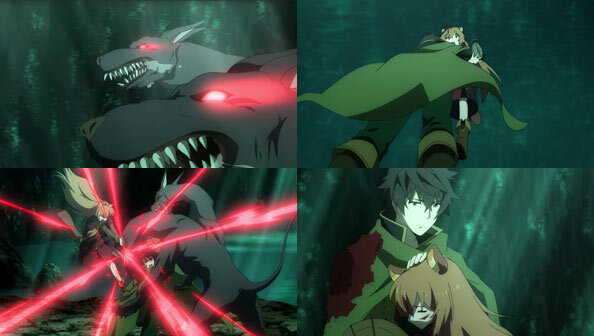 But when Naofumi lays out the stakes vis-a-vis the impending Waves, Raphtalia’s resistance (which causes the shocks) fades away, and she resolves to fight and kill for Naofumi, for both their sakes. Naofumi discovers he has a knack for medicine-making, and he and Naphtalia travel to a smaller town to sell their wares—popular due to the trying times. In a nice bit of good luck for a change, merchant he deals with apparently doesn’t know he’s the Shield Hero, and thus isn’t automatically against him like everyone in the city. He even points the pair to a mine where they’ll be able to make a lot of quick money harvesting ore. The catch is that since the First Wave the mines are crawling with monsters, and a two-headed dog very similar to the one that killed Naphtalia’s parents attacks them, she freezes in terror. Naofumi grabs her and escape the beast, but they have to kill it if they’re going to have any chance against future foes. When things seem to be going south and he offers to buy time so she can escape, she recalls her folks doing the same thing and getting killed for it. So rather than let Naofumi repeat their sacrifice and leave her all alone once again, she draws her sword and plunges it into the beast. When it lunges at her in response Naofumi is ready with a shield to protect her, and she’s able to finish it off. When the fight is over they’ve gained a buttload of EXP, and she collapses crying into his arms, calling him “Naofumi-sama” for the first time. I’m glad that after a double episode’s worth of Naofumi getting beaten down, he’s found something pure and good to protect, as well as the means of progressing in this game-like world while appreciating that it isn’t really a game, it’s a matter of life and death. It doesn’t hurt that Naphtalia is adorable as all get out, but also tough and capable when she needs to be. No doubt when and if he encounters the other heroes they’ll get the wrong idea, but this looks like the beginning of a lovely partnership. 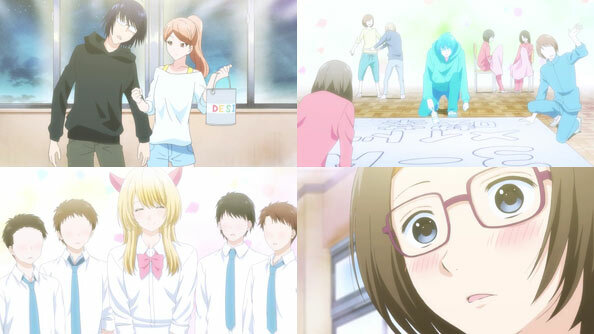 Hikari and Itou are alone in the classroom painting and sewing late at night, and falling behind, but Ishino arrives with a squadron of classmates to help out. They thought she was a ghoul at first, so unaccustomed to being assisted in things that were foisted upon them. Things have certainly changed for the better with these two. 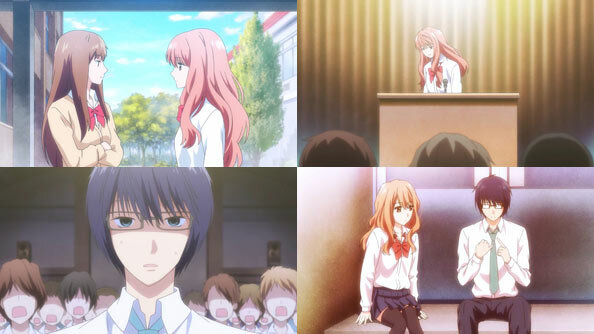 The day of the festival arrives, and Itou goes all out for the class, cross-dressing and wearing a wig. To the surprise of male and female classmates alike, he’s stunning, and even Ayado can’t help but take a break from her own busy day to check in on Itou, and is similarly enchanted. When Ishino asks Itou why he’s working so hard, Itou tells her: because someone helped him get the lay of the land maid cafe-wise, and it would be an insult to her not to give it his all. Ayado happens to hear this from the other side of the wall, and she’s both glad her advice went to good use and flattered it was taken to heart with such conviction. As the preliminary beauty contest vote comes in, Takanashi tries to joke around with Ishino about not having a chance…until she starts legit crying. Knowing he went way too far, he course corrects by giving her his honest opinion, with no joking around: she is pretty, and was cute in the maid outfit, and for what it’s worth, she has his vote. Frankly, his vote is probably all she wanted anyway! Iroha’s main rival tries to rattle her, and when it’s time to give a little speech on stage, that rival’s voice is suddenly an octave higher and much more playful. While Iroha played around with the idea of winning this thing, her own attempts to sound stupid and cute ultimately fail when she gives up in the middle and instead tells the assembled student body that she’s plenty satisfied that the friends she has love her for reasons other than her looks, and she doesn’t really give a crap about anyone else, especially if they don’t know her. Her no-BS honesty probably ended up helping her cause, as all it would’ve taken is a vote from her boyfriend to win. But because she told him she wasn’t really all that interested in winning, Hikari votes for the other girl instead. Iroha predictably takes her defeat in stride, and is consoled by hearing some (but not all) of the many reasons Hikari likes her besides her looks. That night, as the festival winds down, Iroha’s class rep serves her some soup from their cafe, knowing she probably didn’t have an opportunity to try it, while she insists he use the opportunity at the bonfire to talk to the girl he likes. Itou finds Ayado still hard at work cleaning up, and when he tries to lend a hand, that hand ends up touching Ayado’s hand, spooking her. She runs off to collect/admonish herself, even giving herself a slap and calling herself stupid. She feels she has no right to have any feelings for someone she turned down. 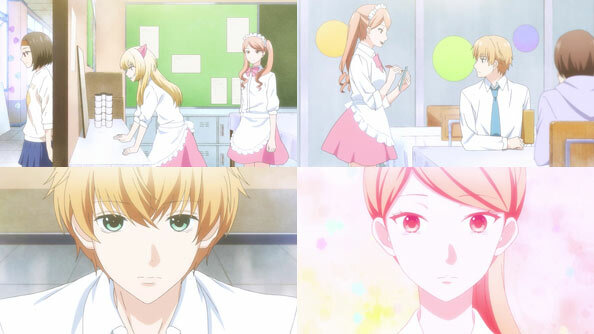 But Itou, worried about her, heard every word, and doesn’t care; if holding his hand helps her to see him as someone she could love, then he wants her to hold it as much as possible. Iroha and Hikari almost intrude upon this tender moment, but thankfully don’t. So maybe it’s not as hopeless for Itou as he thought last week!